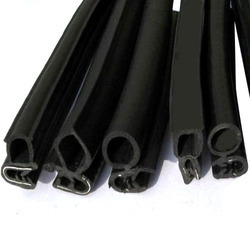 Prominent & Leading Exporter from Mumbai, we offer co-extruded rubber profiles. Being a quality centric organization, we are offering a premium quality Co-Extruded Rubber Profiles. Osaka- Solid and Sponge Rubber Gaskets with a flexible steel spine is the most common and by far the most important application of the EPDM based sealing system in automobile. These seals are dynamic and also called as Door Seals. It is used to seal the door flange firmly to avoid dust, water & air to leak inside.This seals are also very important as far as aesthetics is concerned. It takes care of the door & Body flange panel variations and gives a smooth look from outside.